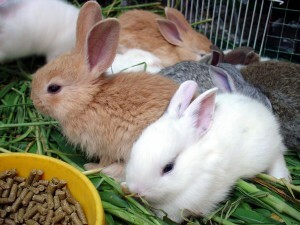 Being there to watch your new litter of baby rabbits growth is some of the most fun time in any rabbit breeder’s hobby. Keep reading for a list of the key ages in your litter’s life and watch them grow into healthy and strong adult bunnies. 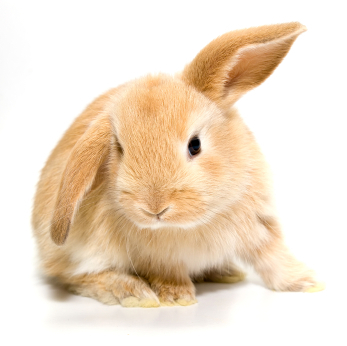 Your kits (baby rabbits) will start to open their eyes and will be turning into little balls of fur. This is when your new bunnies start exploring the world outside their nest box and will be running around the cage. If anyone wanders out before this time always put them back into the nest box, they may have accidentally fallen out. Time for everyone to get kicked out of the nest! At this baby rabbit growth stage you’ll start to see more independence from the kits and you’ll need to remove the nest box from the cage to keep the kits free from infection (those nest boxes can harbor some nasty things!). Add a small piece of plastic cage liner or carpet if you have wire floors and want the babies to have something to stand on. As early as five weeks but no later than eight weeks old you should wean (remove) the kits from their mother. I like to take everyone (except mom) and move them all into their own cage to ease the stress then, one week later, everyone gets separated into their own cages. If you have any more questions about baby rabbits growth or want to learn more about breeding we recommend that you take a look at our book “How to Breed a Rabbit” on Amazon. Don’t forget to be feeding those little guys the right kind of food! 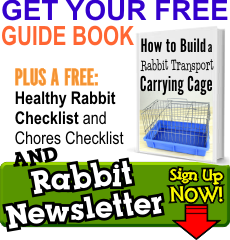 Check out our post on feeding your rabbits in the Rabbit Basics section to learn more!